1. The Chairman of the Crescent Committee collects astronomical information and submits it to the other members of the Committee on the twenty-fifth of each [lunar] month. 2. Members of the Committee shall review and exchange the information and prospects for the first views by the twenty-seventh of the month. 3. The Coordinator shall prepare a first draft in Arabic and English and shall redistribute it to the members by the twenty-eighth of the month. 4. The Coordinator shall communicate, on the twenty-eighth of the month, to all trusted observers in the areas where the crescent sighting is forecast to urge them to investigate the sighting the following night. 5. The Committee awaits the documented reports to ascertain whether the crescent was sighted or not. 6. The Committee adopts the jurisprudential view of the Supreme Religious Authority, considering the majority situation, and does not address the views of other jurists due to the difficulty of surveying them quickly on the night of the announcement. A. Ensure that two just male believers whose witness is identical in terms of the crescent and the location of the observation have seen it. B. Ensure that their testimony does not conflict with the denial of astronomy. C. Ensure that their testimony does not conflict with others who went out to sight the crescent in similar circumstances with respect to factors such as clarity of the atmosphere. D. The testimony of one just male believer along with his oath is not sufficient, nor is the sighting via telescope or the testimony of women. E. Widespread reports based on some people sighting the crescent and others not sighting it are not sufficient. Rather what is considered sufficient are numerous widespread reports of sighting the crescent: “if a hundred people see it one thousand can see it as well”. F. The crescent is established through certainty or contentment. Therefore, if astronomical data indicate that the crescent can be visible on the horizon, however due to barriers like clouds and smoke, it is not visible, it is permissible to rely on such astronomical data as long as it yields certainty or contentment. 8. 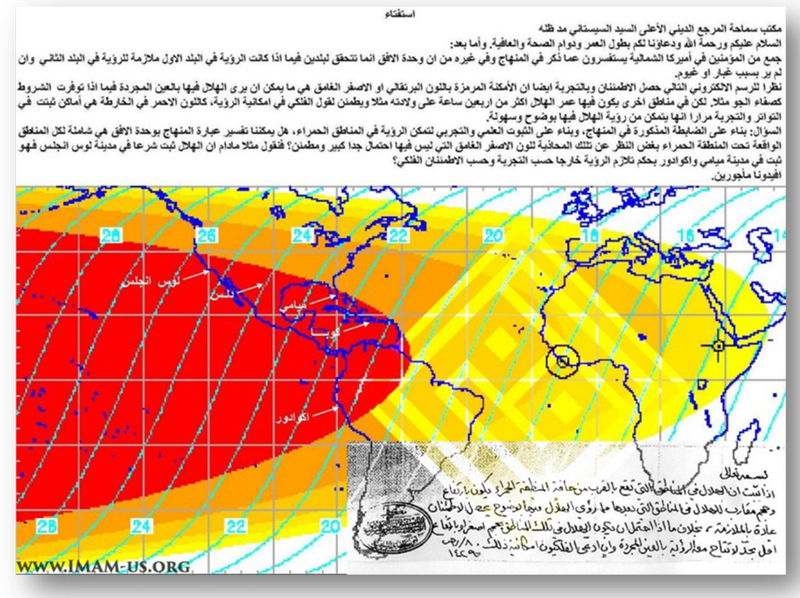 If the sighting of the crescent is established based on religious criteria, the horizontal line must be determined. A. 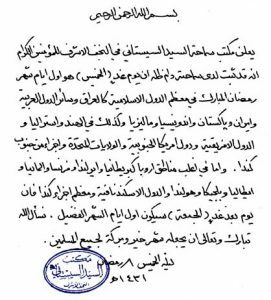 Based on the verdict of His Eminence al-Sayyid al-Sistani, if the unity of horizon when the altitude of the crescent and its lighting degree is close to the area in which the sighting has been confirmed, the crescent will be considered confirmed there as well. (A copy of the verdict about this is below). 9. When a disagreement or a sensitive situation occurs, members of the Crescent Committee hold an urgent telephone meeting to discuss the situation and make the final decision. 10. In the normal case, the Coordinator shall send the final draft for final decision by the members of the Committee on the twenty-ninth night, within no more than half an hour. If there is no need for amendment, correction, or replacement, the Chairman of the Committee shall issue the statement. 11. 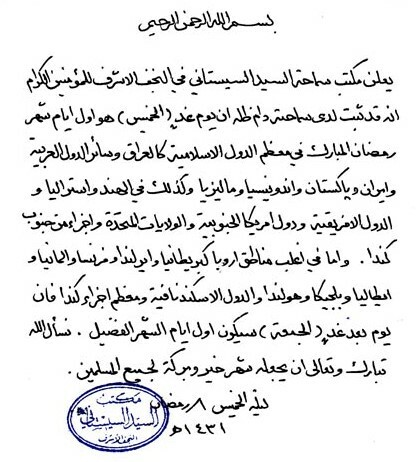 If the Chairman of the Committee or any of its members are prevented from attending the meeting or responding to a telephone call because of a commitment to religious programs on the night of the occasion in sensitive months, and this would cause a delay in acting, the Coordinator will be fully authorized by the Committee to act as required in accordance with established regulations. 12. Statements are issued on the twenty-ninth of each month, in two styles: either no sighting is confirmed and thus the month is a complete thirty days, or the sighting is confirmed and the month will be twenty-nine days.